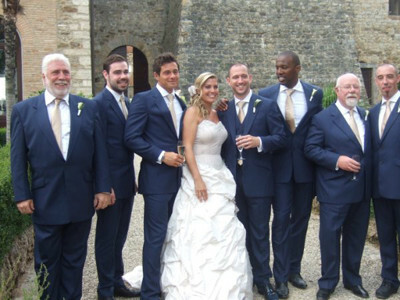 Henry Herbert was privileged to make a wedding suit for this groom and the six suits for his six best men. The wedding took place in Italy and he chose a lightweight pure blue, English wool from Dugdale to cope with the higher Italian temperatures. Each man was measured individually and each pattern was cut individually, allowing us to cater for the variety of heights, shapes and sizes. They all looked terrific. Made with a canvass, the suits are British made and cut. As much of the suit as possible is hand tailored. As with every suit we make, unless you choose our Express service, the suit will take 8-9 weeks to make – we have a half way baste fitting and then a forward baste fitting before the suit is finished and delivered. The cloth was from English made wool, from Dugdale Bros, with working buttons and horn buttons. A 'Seven Course' Wedding - Bespoke Suits By Savile Row Tailors.